Heart shaped cushions are the most trendy way of expressing the message "I Love You", "Happy Birthday" or "Congratulation". Gifting a printed cushion is definitely a lovely idea. Now you can easily go for ordering themed cushion gift from the online store of FlowerAura. One of the most quirky, yet adorable and sometimes a forever token of love, Themed cushions can also add an aesthetic appeal to the house of your loved ones. With a personal touch and extra plush comfort, these designer cushions online are an excellent present for all occasions. It truly is a thoughtful present and more so, leaves a lasting remembrance in the minds of your special ones. A forever reminder of your love and admiration for the receiver. Themed or printed Cushions display how much effort you have put into the very thought of making your loved one feel special. And there’s no denial, that this thought counts. With multiple options available to choose from, and a wide variety of colors, you can find designer cushions online India for all occasions at FlowerAura. From Red, and pink to gray and white, we have got in stores a truly impressive collection of printed cushions. Furthermore, we have made such thoughtful combinations of gift ideas for men that include designer cushions, designer mugs, handmade and branded chocolates and even more that suit the need of every occasion ranging from Mother’s Day, Valentine’s Day, Father’s Day, Rakshabandhan, Friendship Day and more. Personalized cushions are suitable for people of different ages and all walks of life. The best thing about pre-personalized cushion printing is that it helps you deliver a better message and a rather unique but meaningful one. Moreover, their designs are also defined and so is the color and size which saves you from the hassles of imagining things and making them better. FlowerAura has designer cushions for Moms, Sisters, Brothers, Daughters, Couples and more and with creative and heartwarming messages such as “Best Mom in the World”, “Keep Calm Because I Love You”, For father “Dad You’re The King”, is one of the best father's day gifts for this coming June. We have a lot in stores for you to express your emotions in the most suitable manner. When it comes to expressing our true love to the loved ones, choosing a personalized gifts item could be a great option. 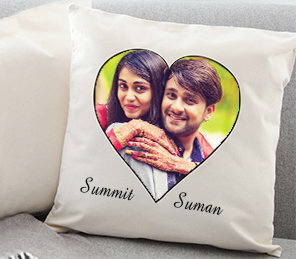 If you are looking for perfect personalized cushion for the most loved person of your life, ordering a themed cushion from the online store of FlowerAura will be a great option for you. This online store simply allows you to customize the cushion with any photo given by you. It is one of the best printed cushion gifts that you can give your loved one as a very delighting present. The best part of ordering heart pillow from this online store is that the entire gift ordering procedure offered by this online store is super simple. All you have to do is select the perfect heart shaped pillow for the loved one of your life, make the payment and mention the right address and this online store will deliver the pillow to the right address. It offers completely free of cost online express delivery service. With FlowerAura’s speedy and timely delivery services, and hyperactive delivery network across the country, there’s no worrying about the correct delivery of the gift to your special ones. Simply choose your favorite pre-personalized Cushion and move to check out where you can finally confirm your order. We usually take 4-5 days for delivery of courier products such as red heart pillow. So, gear up and surprise your special ones with heartwarming designer cushions.